GARLAND, Texas — You might typically associate the days after Christmas as a time when people start returning things in mass quantities. But remember all those Black Friday sales? A lot of those sale items actually get returned right now. The items consumers take back to stores — or even send back after ordering online — make up an entire business of their own. Inventory at a warehouse for a company in Texas that deals in surplus asset management includes anything consumers open, from computers to toys to appliances — and even toilet paper. Everything in the entire warehouse is a return, sent back to the store or website from where it came. "The inventory we tend to see is inventory that is damaged in shipping or has been opened by the consumer and therefore cannot be put back on the shelf at the retailers location, said Brian Johnson, senior vice president at Liquidity Services. 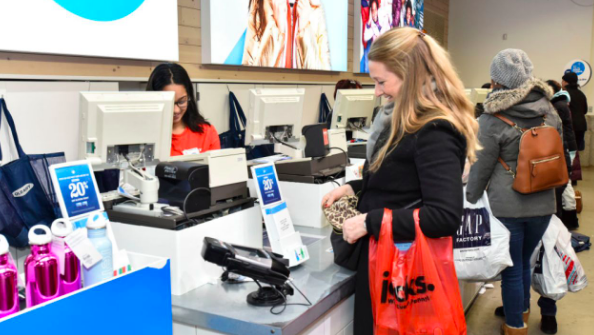 It's a company that takes returns that retailers don’t want to hassle with — their clients include the Top 5 largest retailers in the U.S., and about half of the biggest online retailers. About 10 percent of [items] from a brick-and-mortar store are returned, and it's even higher in e-commerce. That means that of the estimated $1 trillion spent this holiday season, $100 billion of that will be returned. That’s where companies like this one come in. They’ll sort the items, and if they’re in resale condition, they’ll prepare them to be sold. “This is our refurbish room. Here we have consumer electronics that warrant us to go in and add value to them. So we test and eventually will repair the product if necessary, so we have the opportunity to sell that right back to the consumer," Johnson said. “Typically the consumer can get that for 60 percent of retail” on items that have been refurbished, he said. People such as Nevin Farrell, a teacher who sells discounted items on ebay for a second income, say it's a money maker. His niche? Beauty products. And Farrell says his rate of return is sometimes 90 percent. What about a resale market for toilet paper — does that exist? "Toilet paper and consumables in general baby diapers are actually very liquid to sell,” Johnson said.